his father, Edward Sr. (and girl next to father in some of these, unidentified friend of family. Both Robinson Sr. and unidentified friend of family wept when Jr. was sentenced to serve 60 days in the county jail. 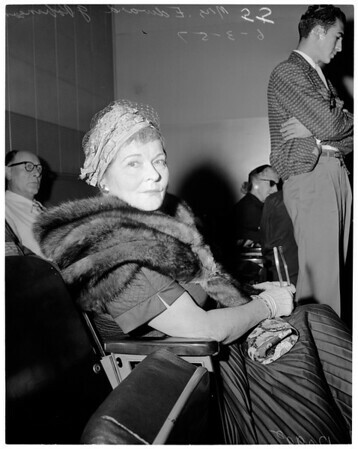 55/56/61: Mrs. Edward G. Robinson Sr. (Gladys) divorced wife of the actor, who also was present in court when her son was sentenced to 60 days in the county jail as a provision of a three-year probation. He was convicted by a jury of misdemeanor drunk driving".